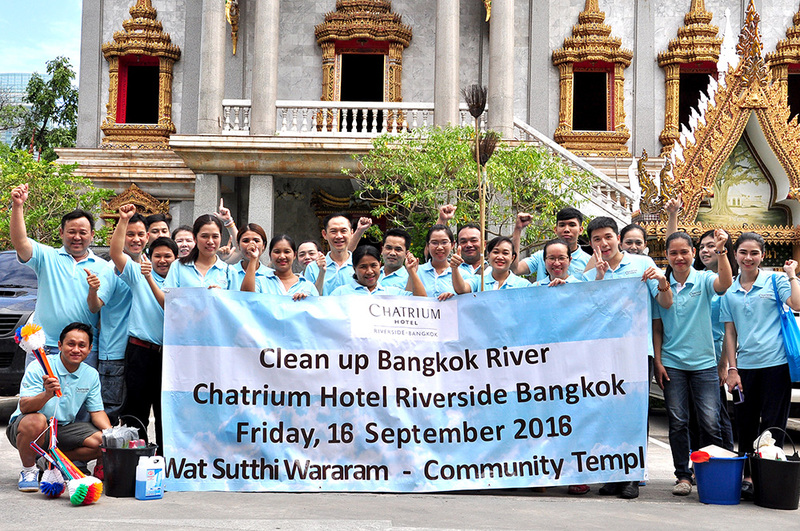 The Resident Manager of Chatrium Hotel Riverside Bangkok Khun Chatchawan Napawan (centre) accompanied by the Chatrium team once again joined the annual “Clean Up Bangkok River” campaign on Friday 16th September 2016. “Clean Up Bangkok River” is part of the community-based “Clean Up the World” environmental campaign that encourages local communities from the four corners of the world to tidy up the areas they inhabit and help conserve the environment of the beautiful planet we call home. In 2016 Chatrium Hotel Riverside Bangkok formed clean up teams with seven fellow riverside hotels where the hotels’ representatives eagerly worked together to rid the streets of litter, tidy up the green spaces in the vicinity and clear debris from the klongs that flow into the Chao Phraya River. Chatrium Hotel Riverside Bangkok’s special task was also to spruce up the compound of Wat Sutthi Wararam, a local temple and the hub and focal point of many community activities.